Sterrenburg, F.A.S. (1991) Studies on the genera Gyrosigma and Pleurosigma (Bacillariophyceae). Light-microscopical criteria for taxonomy. 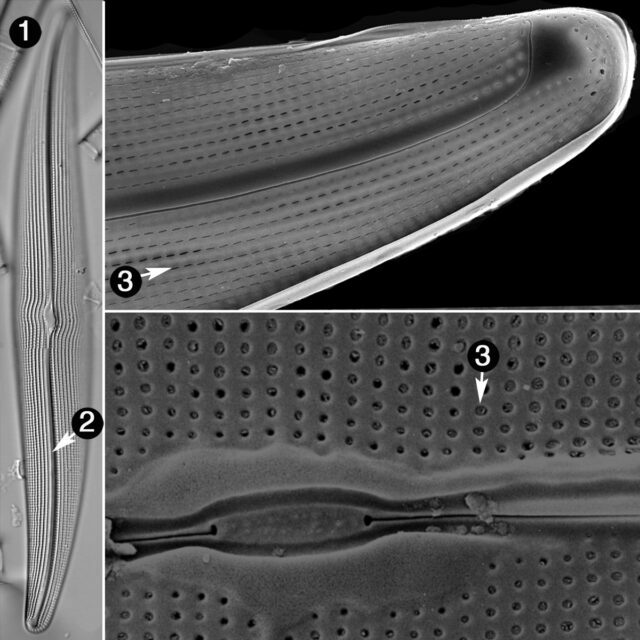 Diatom Research 6: 367-389. Sterrenburg, F.A.S. (1992) Studies on the genera Gyrosigma and Pleurosigma (Bacillariophyceae). The type of the genus Gyrosigma and other Attenuati sensu Peragallo. Diatom Research 7: 137-155. Sterrenburg, F.A.S. (1993) Studies on the genera Gyrosigma and Pleurosigma (Bacillariophyceae). Rules controlling raphe fissure morphogenesis in Gyrosigma. Diatom Research 8: 457-463. Sterrenburg, F.A.S. (1994) Studies on the genera Gyrosigma and Pleurosigma (Bacillariophyceae). Proceedings of the Academy of Natural Sciences of Philadelphia 145: 217-236. Sterrenburg, F.A.S. (1994) Studies on the genera Gyrosigma and Pleurosigma (Bacillariophyceae). The species of Sullivant & Wormley 1859, synonymy and differentiation from other Gyrosigma taxa. Proceedings Academy of Natural Sciences of Philadelphia 145: 217-236. Sterrenburg, F.A.S. (1995) Studies on the genera Gyrosigma and Pleurosigma (Bacillariophyceae). Gyrosigma acuminatum (Kützing) Rabenhorst, G. spenceri (Quekett) Griffith et Henfrey and G. rautenbachiae Cholnoky. Proceedings Academy of Natural Sciences of Philadelphia 146: 467-480. Sterrenburg, F.A.S. (1997) Studies on the genera Gyrosigma and Pleurosigma (Bacillariophyceae). Gyrosigma kuetzingii (Grunow) Cleve and G. peisonis (Grunow) Hustedt. Proceedings Academy of Natural Sciences of Philadelphia 148: 157-163. Sterrenburg, F.A.S. and Underwood, G.J.C. (1997) Studies on the genera Gyrosigma and Pleurosigma (Bacillariophyceae). The marine Gyrosigma spenceri records: Gyrosigma limosum Sterrenburg et Underwood nov. sp. Proceedings Academy of Natural Sciences of Philadelphia 148: 165-169.